Now that members have made a bunch of fused glass cabochons this week, what can we do with them? You can make several cabochons and mount them on your own Medieval style gemstone covered book, hot glue it onto your stapler at work and really establish that one is yours, make some really shiny refrigerator magnets but jewelry is the most common application. 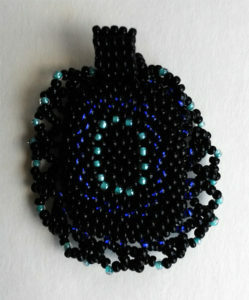 I encased my cabochon in a mount by free form hand weaving seed beads. This piece used different stitches and a strong nylon mono-filament thread. The beads are 11/0 size Czech glass and 15/0 size Japanese Miyuki glass. I encased the whole cabochon because the back of the fused glass was rough and uneven. 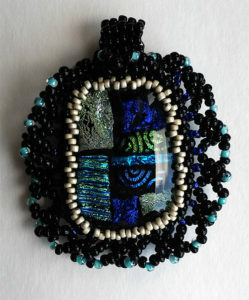 You can stitch bead embroidery around the cabochon securing it onto a backing of leather or heavy fabric. This will be similar to my example but simpler in its execution. Glue on a bar pin back to wear it as a pin. Glue on a bail to wear it on a chain or cord. There are many colors, sizes and shapes of ready made jewelry bails. Wire wrap the cabochon with jewelry wire. Given the resources we have at the space, someone could even 3D print a setting for their piece and then cast it in metal!